The beautiful Avalon Theatre, Fallsview Casino Niagara. One of the cool perks I get to enjoy singing at Brasa Brazilian Steakhouse is the stunning view of the Fallsview Casino courtyard. Looking out the front of The Hilton you have an almost eye level view of the Casino's massive electronic billboard. Over the years, I have enjoyed looking to see which famous person would be performing across the street from me and if possible I will usually try to sing a song by the artist and plug their show on my mic. You never know who can be in the audience! I have had the chance to sing Smooth Operator with Emmanuel Lewis (Webster) on his birthday, met Kevin Sorbo when he was in Niagara for Comic Con, and Natasha Bedingfield enjoyed cocktails in front of me while I performed Valerie by Amy Winehouse just a few months ago. The Hilton Fallsview Hotel clocktower. 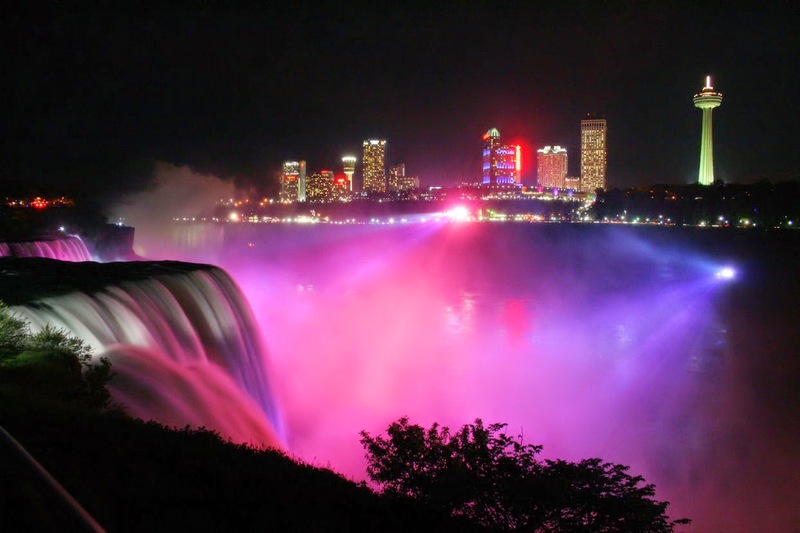 Niagara Falls is growing in popularity world-wide as it is becoming Canada's epicenter for destination vacations. One of the contributing factors are the headlining acts brought in by the Fallsview Casino. The Avalon Theatre provides 1500 guests with an up close and personal experience in a state of the art performance venue. With over 250 shows a year, including full scale productions, the Avalon Theatre hosts world-class entertainment right here in our own city. Be sure to enjoy what Niagara has to offer this Spring and spoil yourself to a dinner and a show. For more information on full concert listings and how to get tickets please follow this link. Over the years I have struggled to find one location where I could find venues in Niagara that had live music. If you google the key words "Niagara Live Music" you will come up with a myriad of Niagara websites that are far from a complete or accurate listing. The best source in my opinion for finding out where you could go out and hear some amazing Niagara talent used to be the St Catharines Standard Niagara DO IT listings. Unfortunately my research has only come across lists from last summer which leads me to believe that the DO IT listings are no longer being published. I am going to look into this and share what my investigation comes up with. Niagara is a hot spot for talent, and with the amount of tourists visiting yearly there really needs to be somewhere where they can go to look up live music listings. After years of frustration, I have decided to embark on what will likely be a large undertaking. I plan on reaching out to every business on this list to compile an accurate reflection of what there is to see in this Niagara Peninsula in terms of live music, hopefully hyper linking their website for complete details. Since this will be a constantly updated project I will need your help, so please contact me if you know of a show or venue that I am missing so that I can update my list. For the purposes of keeping this blog Live Music based I am going to focus on just live music, not club, DJ's or Karaoke Bars. Please email me via the contact form or simply add a comment to this blog. AG INSPIRED CUISINE: 289-292-0005. 5195 Magdalen Ave., Niagara Falls. ANGEL INN: 224 Regent St., Niagara-on-the-Lake. BIG MARCOS RESTAURANT: 274 4th Avenue Louth 905-641-4411. BLIND REFEREE: Dance Music by DJ T, Fridays. 338 Merritt St. 905-680-5050. BLUE MERMAID SEAFOOD AND STEAKHOUSE: Thursdays, Fridays and Saturdays. 10 Market Square, 905-684-7465. 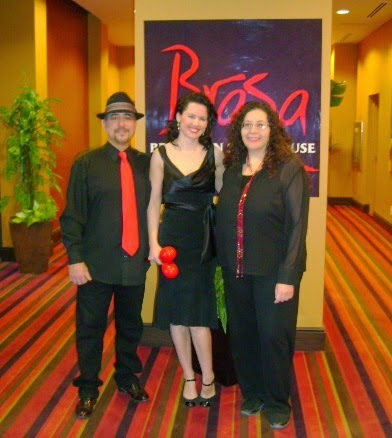 BRASA BRAZILIAN STEAKHOUSE: Live Latin, Jazz and Pop music with The Rio Trio. Friday, Saturday and Sunday, 7-10 p.m. Hilton Fallsview Hotel, Fallsview Blvd., Niagara Falls, 905-353-7187. BUCHANANS CHOPHOUSE: 6022 Stanley Ave., Niagara Falls (DoubleTree), 905-353-4111. CACHE: 44 James St. 905-641-0007. CAFE ON MAIN: 1455 Pelham St., Fonthill. 905-892-1188. CAPITOL Q: 905-357-0631. 4317 Queen St., Niagara Falls. CASA MIA: 3518 Portage Rd., Niagara Falls. 905-356-5410. CAT’S CABOOSE: 224 Glenridge Ave., 905-682-0139. CHEERS BAR AND GRILL: 358 Ontario St., 905-704-0676. CHURCHILL LOUNGE: Live Music every Friday night 9-11 p.m. Located in the Prince of Wales Hotel, Niagara-on-the-Lake. CLANCY’S: 5233 Stanley Ave, Niagara Falls, 905-357-4112. COACH AND HORSES PUB: Queen St., Niagara-on-the-Lake. COPACABANA BRAZILIAN RESTAURANT: 6671 Fallsview Blvd. Niagara Falls. COCO’S LOUNGE: Holiday Inn, 5339 Murray St., Niagara Falls (across from Casino Niagara). CRACKERJACKS BAR AND GRILL: Music trivia every Wednesday. 207 Keefer Rd. Thorold. 905-680-5066. DONNELLY’S PUB: 54 Front St., Thorold. 905-227-1947. DUNN STREET GRILL: 6095 Dunn St., Niagara Falls. FALLSVIEW CASINO RESORT: The 365 Club — Ticket and information, call Ticketmaster 1-877-833-3110 or ticketmaster.ca. FEATHERY PUB:. 905-687-3553. 420 Vansickle Rd. FIDDLER’S POUR HOUSE: June 9, 7:20 p.m. 149 St. Paul St. 905-641-8251. FORTIS RESTAURANT: 135 Queenston St., 905-682-6167. FRADO’S: 535 Queenston St., 905-684-5484. GOLDEN BROTHERS BAR: 10 Geneva St., 905-688-8118. GOLDEN PHEASANT (THE DUCK): 244 Ontario St., 905-687-9505. GRAND CENTRAL BAR AND GRILL: 4573 Queen St., Niagara Falls. For more information, contact 905-357-9000. GRIMSBY LEGION: 233 Elizabeth St., Grimsby. HEMINGWAY’S TAP AND EATERY: 547 Ontario St. L2N 4N4 905-397-7770. (Formerly The Street) 547 Ontario St. 905-397-7770. HISTORIC NIAGARA ARTISTIC EXHIBITION CENTRE: 4323 Queen St., Niagara Falls, 289-969-4229. HOUSE OF COMEDY: Entertainment Friday and Saturday, 9 p.m., 4189 Stanley Ave., Niagara Falls, 905-357-7469. IRISH HARP PUB: Irish music with Finnegan's Wake, Fridays 8-11 pm, 245 King St., Niagara-on-the-Lake, 905-468-4443. JORDAN HOUSE TAVERN: 751 Main St., Jordan, 905-562-9591, ext. 2. KEG STEAKHOUSE AND BAR: Located in the Marriott Courtyard Hotel, 5950 Victoria Ave., Niagara Falls. 905-358-3083. KILT AND CLOVER BEAMSVILLE: 5205 King St., Beamsville, 289-566-8843. KILT AND CLOVER PORT DALHOUSIE: Lock St., Port Dalhousie, 905-646-8917. L3: 6 James St., St. Catharines. www.l3nightclub.ca. 905-688-8888. MAHTAY CAFE AND LOUNGE: 241 St. Paul St. 905-685-4040. MANSION HOUSE: William St. 905-685-5651. MAPLE LEAF TAVERN: 5831 Ferry St., Niagara Falls, 905-358-6764. MARKET SQUARE STAGE: Downtown St. Catharines. MERCHANT ALE HOUSE: St. Paul St., downtown St. Catharines. MOOSE AND GOOSE: Country music Fridays. 54 Front St., Thorold. 905-227-6969. MURPHYS RESTAURANT: 38 Lakeport Rd. 905-934-1913. MYST LOUNGE: Live Entertainment Friday and Saturday nights, Hilton Fallsview Hotel, Fallsview Blvd., Niagara Falls, 905-353-7187. OFFICE TAP & GRILL: DJ Tanner, 2 turntables with videos, Saturdays. 22 James St., St. Catharines, 905-984-4440. PALMWOOD: Live bands on the patio every Saturday night. 3823 Terrace Lane, Crystal Beach. 905-894-0820. PARIS CREPES CAFE: 4613 Queen St., Niagara Falls. PATRICK SHEEHAN’S: St. Paul St., St. Catharines. PEGASUS TAP EATERY: 3626 Portage Rd. Niagara Falls. 905-353-0142. PLANET NIGHTCLUB: 4585 Queen St., Niagara Falls. 905-371-3030. PUDDY’S BAR & GRILL: 36 Wright St., 905-684-9990. ROCKFORD’S: 88 St. Paul St., 905-988-5390. SOUTH SIDE 543: DJ, Thursdays. 543 Allanburg Rd., Thorold, 905-227-5500. SPYCE LOUNGE: Live entertainment nightly, Hilton Fallsview Hotel, Fallsview Blvd., Niagara Falls, 905-353-7187. STELLAS RESTAURANT: 45 James St. 905-685-3000. STREGA CAFE: Open mic, Thursdays. 19 King St., 905-984-5872. SUDZZ BAR AND GRILL: 6865 Dawson St. (corner of Dorchester Rd. ), Niagara Falls. 905-354-6711. TEDDY’S: 28 Main St., Grimsby. TJ’S SPORTS BAR: 448 Welland Ave, St. Catharines, 905-688-5176. TOUCHDOWN WILLY’S: 239 Saint Catharines St., Smithville. 905-957-8448. URBAN STEAKHOUSE & LOUNGE: Highway 20, Fonthill, 905-892-3322. WELLAND LEGION: 5705 Falls Ave., Niagara Falls, 905-262-5233. YUK YUK’S: For tickets and information, call 905-262-5233. Niagara Falls, Ontario Canada. "Canada's mini-Vegas"
Working as an entertainer all year round means I don't get to play tourist often. But when I do, I find it refreshing to enjoy the many commodities and attractions residents of Niagara tend to take for granted. Recently you may have heard a funny moniker that compares Niagara Falls to Las Vegas by calling it "Canada's Mini Vegas". I know I have, so this week I will blog about why this is becoming a reality. 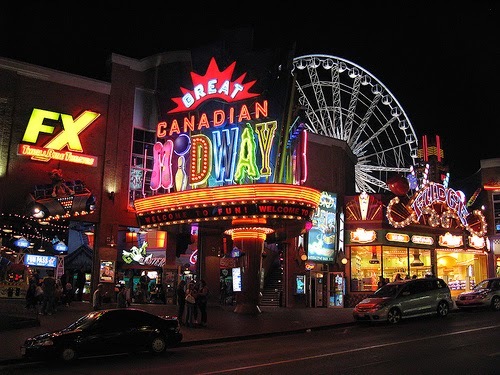 Niagara Falls, Ontario is home to a bounty of activities appropriate for all ages ranging from The Falls, Marineland, water-parks, and a downtown mid-way called Clifton Hill District that has rides, museums and adventure rooms. But recently there has been a push by the major hotel chains to cater to a different demographic. Marketing has shifted focus to the adult lifestyle and here are some reasons why. Toronto is only 90 min away, and for many GTA residents the concept of a weekend "get-away" means going to Niagara Falls for a mini-vegas style vacation. Minus the warm weather of course. This population of 25-45 year old professionals are looking to spend money and have a good time. No kids allowed. 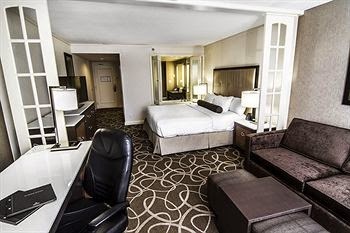 An ideal weekend for this prospective tourist should start with booking a room at The Hilton Fallsview Hotel Resort, where you can enjoy Hilton service right across the street from the Fallsview Casino Resort. This Hilton has the highest hotel tower in Canada, and built a glass-hallway that connects you directly to the Casino without ever having to step outside. This is great perk for those adventure types who brave the winter in high-heels and spandex mini-skirts. You can enjoy dinner at one of The Hilton's three signature restaurants, Brasa Brazilian Steakhouse (make sure you come say hi to me! ), The Watermark Restaurant, or Pranzo Italian Grill prior to going out on the town. If your in the mood for a drink, Spyce Lounge located on the main floor not only serves exotic martini's and also features a menu with light snack's to start off the night. The next step on this Niagara adventure usually involves going to the Fallsview Casino Resort to play cards or to see a show. The Avalon Theatre brings world-class acts to Niagara all year round. 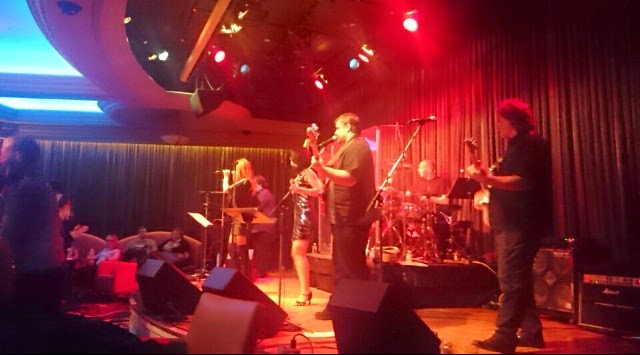 Club 365, where I performed just last weekend with the Sister Act Band, is located right off the gaming floor. Anyone looking for a club experience with bottle-service can visit Dragonfly Nightclub, and those who want a more intimate venue can enjoy breathtaking views of The Falls up in the R5 Restaurant & Lounge. To ease your body aches no vacation is complete without a visit to the Spa. And you don't have to go far to find one, there are several within a few block radius of Fallsview Boulvard. 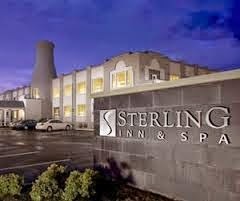 One boutique hotel called the Sterling Inn & Spa offers couples massages and a contemporary chic decor. But if you have time for a day trip to Niagara-on-the-lake, I highly recommend spoiling yourself at the White Oaks Resort & Spa or one of the luxurious Vintage Hotels locations. All this excitement and your home within hours, no air travel required! With how much the Niagara Region has to offer, it's no surprise that business is exploding in this market. I can't wait to see what's in store for Niagara in the next five to 10 years. If you have any suggestions on must-see attractions or recommendations for me to blog about please share them with me! 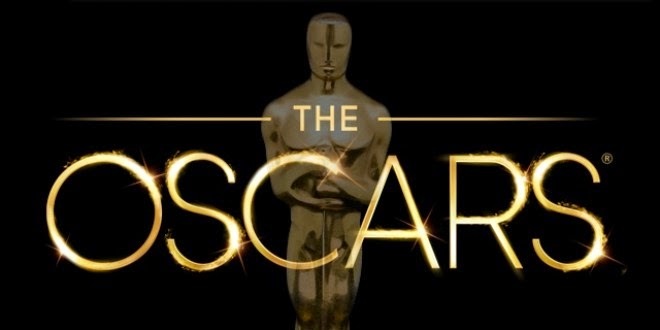 Although I will admit I was not able to watch this years Oscars because I had to perform, it was not long before I started to hear about Lady Gaga's performance of The Sound of Music medley. In my second blog I described my childhood as being similar to that of the Von Trapp's, so naturally I was very excited to hear how this cross-over turned out. The first sound clips I heard honestly blew my mind. Who was this singing and what did they do with Lady Gaga! Of course many people had their own opinion and I am shocked to see the negative press and tweets from celebrities who felt Idina Menzel should have been the one to perform this. I highly doubt the Oscars Artistic Director had wanted a woman with the high-pitched nasal voice of a child to sing Julie Andrews music. Not to mention, Lady Gaga worked with a vocal coach from the Oscars for six months prior to the show in order to perfect her vocal techniques. After listening to her complete performance on YouTube, I can say that her vibrato was very controlled, her pitch and tonality on the notes in the upper register were bang on, and her key changes in between songs were flawless. Two of the pieces were originally sung by a man, so there is no way Idina Menzel could have pulled that off. Just not the right voice type at all for this material. This has been a great year for Lady Gaga in terms of love and career success. Not only did she recently get engaged to actor Taylor Kinney, she also put out a Jazz album with Tony Bennett, proving to the world that she can really sing, and she can sing anything. A true talent is diverse and can make anything sound good. I think an Amercian Idol judge said that once! She is also set to star in the upcoming season of American Horror Story, one of the only two TV series I actually make time to watch. Since I love Lady Gaga so much, I had to do a cover of at least one of her songs. Here is a version I perform by my girl Marcela Mangebeira a la bossa nova style. Enjoy! If you were not in the loop this week, I have posted the video here for you to judge. Did Lady Gaga fail miserably? Did she do a better job than Carrie Underwood's Live TV Performance? Please share your thoughts on this, inquiring minds want to know! I woke up today with a sore throat, body aches and congestion. This is when most of us start praying that it won't get worse the next day. For singers, this is a especially stressful time since singing sick is one of the worst experiences. Most people can take a day off or find someone to take their shift in order to get better, but the average singer in a band doesn't have a substitute. In many cases if the singer is sick, then the show gets cancelled. The pressure of knowing that everything falls on your shoulders can be difficult, however with experience singing sick just becomes part of the job. It is rare for performers to stay healthy all year round. Performance schedules, travel and constant contact with the public punishes the immune system. Over the years, I have discovered some home treatments that work for me. No miracle cures, but things that help me get through my shows. I have sung with Laryngitis, throat infections, strep throat, colds and the flu. Not that it is smart to work instead of rest, but sometimes you have no choice. Here are some tips on how to sing sick. This may sound funny, but the simple act of talking can make you hoarse. Celine Dion answers questions by tapping on her phone on the day of a show. Even whispering uses your vocal chords so avoid talking unnecessarily all day. Start to do some warm ups a few hours before your show. This will help you gauge where your voice may crack so you can avoid songs in that key. This may sound gross, but clearing out the sinuses is essential. You can also boil some water in a pot, add Vicks Vaporub, put a towel over your head and inhale slowly. I did this when I was sick with the flu and had to sing at the Niagara Food Festival. It was the only time I had to use this technique and it got me through two 45 minute sets. Personally I avoid taking drugs because I hate swallowing pills. Medication can also give you dry mouth and upset stomach. But this is the only time that I will cave and convince myself to take some. 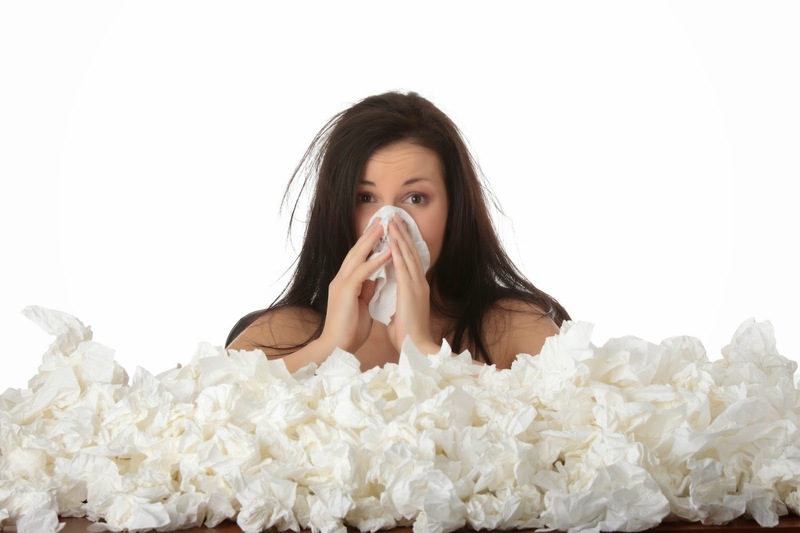 The reality is you have to dry up the sinuses in order to avoid coughing. Coughing is your worst enemy because it makes you hoarse. The pain-reliever is to take away the body pain and sore throat. Unfortunately, I have never found alcohol to be helpful. This is the hardest step because not everyone has the ability to suffer with a smile. But that's your job. It takes sheer determination and inner strength to push through when performing sick, but every time you succeed it amounts to more experience singing under the worst conditions. When i'm feeling discouraged I like to read this excerpt by David Ackert from the LA Times for inspiration. Lemon is antiseptic, aids digestion, and is great source of calcium, magnesium, vitamin C, bioflavonoids. Honey is antibacterial, antioxidant, anti-tumor, anti-inflammatory, and antiviral. 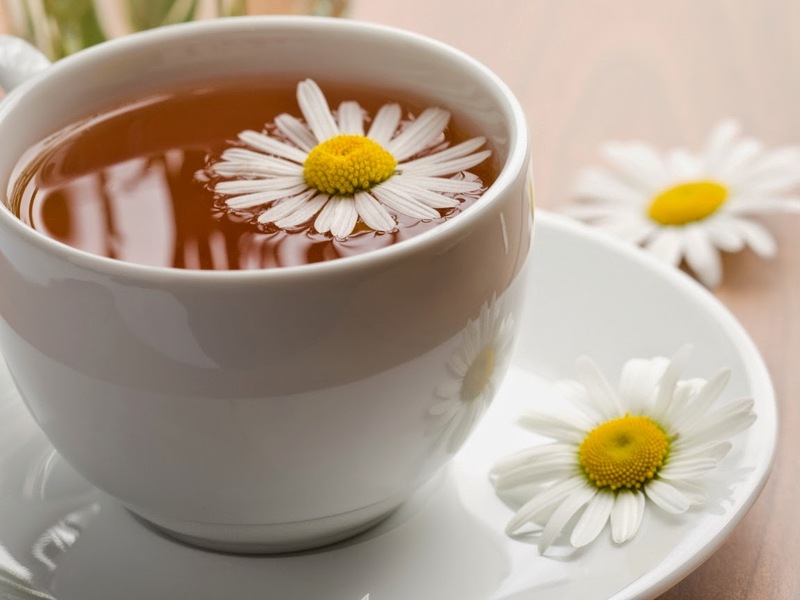 Chamomile helps to ease upset stomach, heartburn, nausea, and vomiting. We have all heard covers of songs that we love. Sometimes they fail our expectations, sometimes they can change how we feel about a song forever. Playing for tourists means less original music and more standards. But that doesn't mean one can't be creative! Part of the challenge lies in finding a great song that people love, and putting your own unique twist on it. Oddly enough, I have found over the years that a bossa nova beat can fit to almost any tune. Not that it always works! But sometimes you get lucky. My goal is to be able to perform a song by any artist should someone request it, but done in a style that suits our venue. One singer from Brazil continues to inspire me with her smooth vocals and intricate chord interpretations. I perform a few of her covers, but this one particular takes the cake. I am proud to say I can sing a Red Hot Chili Peppers song in a restaurant, but it's pretty much unrecognizable until the vocals come in. Check out this Marcela Mangabeira cover of By The Way. There are full cover albums of popular music covered in a Bossa Nova style such as Bob Marley, The Rolling Stones and Guns n' Roses should you like to search for more songs in this genre. Another amazing cover that we play at Brasa that you have to hear is a Nirvana song covered by the Buena Vista Social Club. This was featured on a compilation by Rhythms Del Mundo, with vocals by Shanade. We made a few changes to suit our trio, but the mood is the same. Less rock, more smooth. Something I never thought possible with a Nirvana song. The last song I'd like to share with you this week is one we have played for over five years now. Coldplay released this salsa version of Clocks on a Rhythm Del Mundo compilation, and it's simply magic. Hope you enjoy, and let me know what you think! were and didn't even have the job yet. If you had asked me 10 years ago where I would see myself working in 2015, I never would have guessed I would find my dream job by pure chance. The truth is I put an ad up on Kijiji with a hunch that if I went fishing I may get lucky. One day I received an email from The Hilton Hotel looking for weekend entertainment who could perform Latin and Brazilian music. So we learned The Girl from Ipanema for the audition and got hired on the spot. At that time The Rio Trio had been playing a fusion of pop, jazz, blues with a splash of world music flair. We then turned our focus to developing a repertoire suitable for a venue where guests can choose to eat or dance. Not an easy undertaking, but one that pushed our creative boundaries. Dream job, check. To say that my parents trained me to be an entertainer is an understatement. I grew up submerged in a music culture similar to that of the Von Trapp's from The Sound of Music. 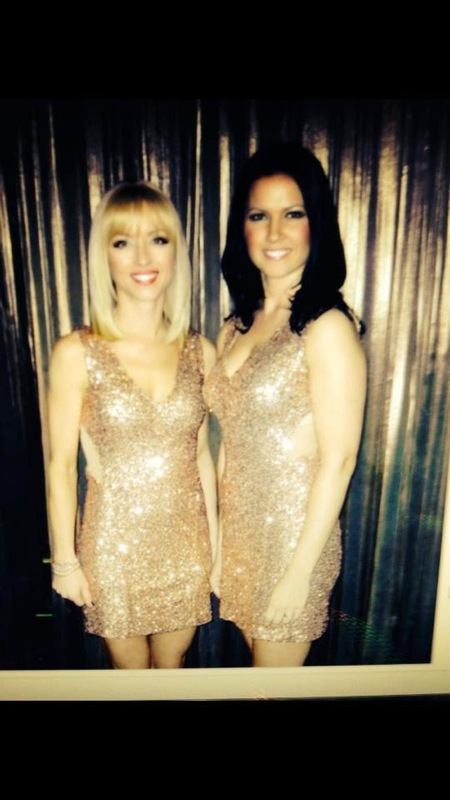 My little sister and I would perform shows for family and friends, in full wardrobe and makeup. I had memorized the entire score to the musical Cats by the age of 12. Both my parents sang as well. We grew up singing together in church choir. 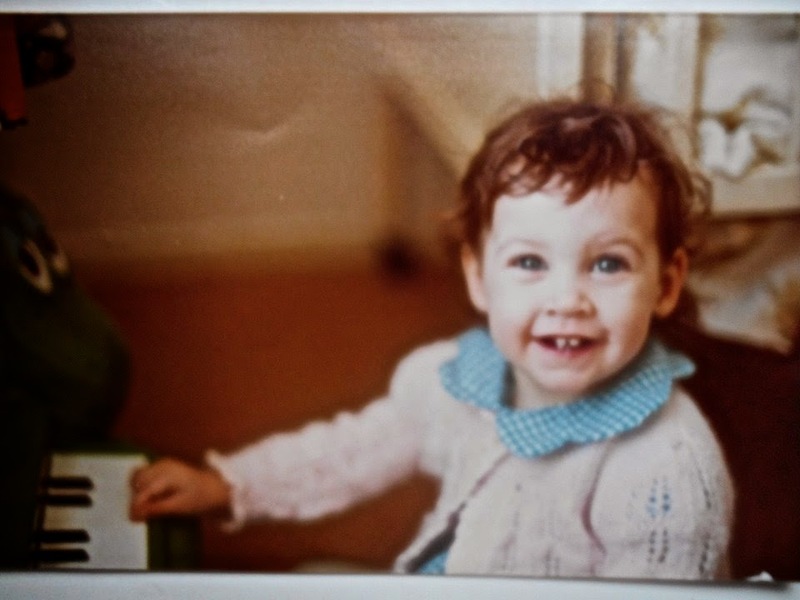 Music was my childhood, and music is now my career. People always ask me "well it's not really like a job is it?”. I am always diplomatic with how I respond to that because I know most do not want to hear that my job could be even considered work. But when a woman vomits two feet from you while your in the middle of singing Guantanamera and shaking maracas, sometimes you ask yourself "why am I here?”. 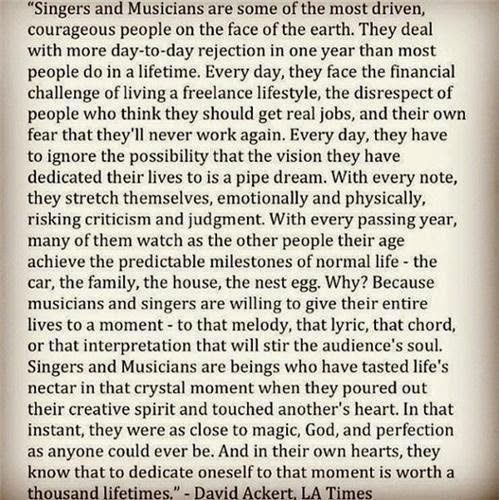 All sarcasm aside, five years singing in a band that specializes in the music that moves me the most is a gift from God. While I never thought I would have to sing La Bamba or The Girl from Ipanema 1000 times a year, there are some songs I never tire of. A certain note strikes my heart every time I sing it. I also try to remind myself that the monotony of having to play some songs whether you feel like it or not is not all that bad. Because that one night you decide to not play that old classic, is the night someone requests it for sure. And then thanks you with a tear in their eye on their way out. I am extremely fortunate to be able to say my life’s passion is my job. The special moments are just an added bonus. From Brightside - Great Questions To Ask Kids, Make It A Game Or Contest!